BingoSpirit offers a special promotion, exclusively for GamingZion readers: $25 no deposit bonus, 20 no deposit free spins and a 500% first deposit bonus is waiting for you to claim! BingoSpirots Exclusive Welcome Bonus for GamingZion readers! BingoSpirit has a special offer for GamingZion readers. Only here can you find the exclusive welcome bonus, which rewards you no deposit bonus, no deposit free spins as well as a 500% first deposit bonus. 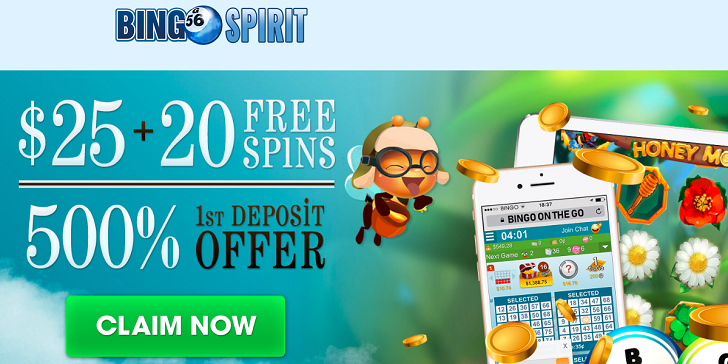 Before getting your 500% extra money, new BingoSpirit players are entitled to claim 20 free spins for the HoneyMoney slot. In addition, you get a $25 no deposit bonus just for registering. You get to spend your exclusive no deposit bonus on any bingo game you like. Hurry up and sign up quickly. The exclusive offer expires as of 1 May, 2019. Check the latest review about BingoSpirit as well! Check out the latest online bingo bonuses in the United States! To learn more about the best Online Bingo Sites in the United States, take a look at the Online Bingo Reviews section.